Billy Batson's edit of The Hobbit. 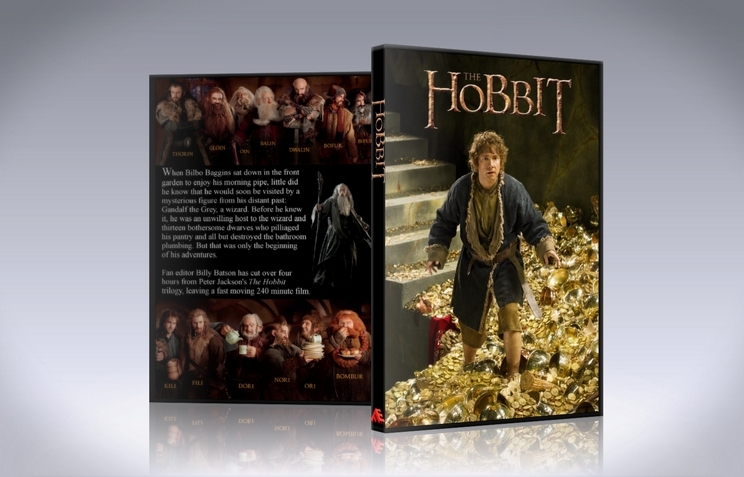 Peter Jackson's The Hobbit trilogy cut into one 4-hour film. Just like damn near everyone else, I've put together a version of The Hobbit. My version is a single standalone movie that adheres more closely to the book and will hopefully be a bit more family friendly, provided you explain to the kiddies that none of those nasty orcs who were beheaded in the film were actually hurt. Like many fan editors, as I sat in the theater watching the three Hobbit films, I was mentally saying to myself, "that scene goes" and "that scene stays." It was pretty evident which parts of the movies did little or nothing to move the story along, so those bits have, for the most part, been consigned to oblivion in this edit. Elements of both the theatrical and extended cuts of all three films have been used, along with the soundtrack album for The Hobbit: An Unexpected Journey and a public domain sound effect of a waterfall. While I'm very pleased with how this edit turned out, the final product would not have been possible without the re-use of ideas from the edits by both Spence and DrFontane. Although the ultimate intent of my edit differs from that of both of these fine fan editors, I found many of Spence's edits to be impossible to surpass and have therefore incorporated some of them into my version of the film. Likewise, I found a number of ideas in DrFontane's edits to be very useful and have adapted them as well. And although I appear to have lost him somewhere along the line, I'm very grateful for the early interest and helpful ideas from revel911. I would not be nearly as pleased with how this project turned out without the helpful feedback and advice from both him and his wife. While my main intent was to delete anything that wasn't in Tolkien's original novel, I do realize that a film adaptation of a literary work is just that, an adaptation. Accordingly, I've retained elements of Jackson's trilogy that do not appear in the book but serve to tell Tolkien's basic story in a visual medium. For example, the Battle of Five Armies portions of the film expand considerably from the parallel material in the original novel, but I felt it necessary to utilize much of Jackson's expansion on that portion of the story in order to better tell the main story. Intended Tone: The best 3 in 1 edit possible. White Orc Plot: Abbreviated. Deleted references to Azog's name and backstory, but kept him in most scenes relating to Bilbo's story. Army from the North plot: They show up at the end. Legolas Inclusion: Abbreviated. He's in Mirkwood, and shows up late in the Battle of Five Armies. Tauriel Inclusion: Deleted, for the most part. She appears in a couple of background shots. Use of Deleted Scenes: No. Chip the Glasses: Yes, along with Bofur's song at Rivendell and the Goblin King's song. Battle for Moria Flashback: No. White Council in Rivendell: No. Gollum scene modified: Not really. Fifteen Birds in Five Fir Trees: Yes, trimmed a bit. Gandalf in Dol Goldur: No. Bilbo fights a bug for the ring: No. Cut other references to the ring being tied to Sauron. Barrel Chase: Yes, but cut the elves and orcs. Dwarves in Laketown: Yes, though abbreviated. Dwarfs coming out of a Toilet: Yes. Dwarves Left Behind in Laketown: No. Orcs & Elves in Laketown: No. Dwarves Give Up at Erebor: No. Black Arrow/Bard's Son & Smaug: No. White Council battles Nazgul: No. Battle of Five Armies - Battle Scene Running Time: 26 minutes from arrival of orc army to Thorin's death. The Master discusses class warfare: No. Alfrid wears a dress: No. Thorin/Azog combat: Yes, edited for pacing. - The beginning is different and more in tune with the book (cool) but i like more the old intro (cutting Frodo). - Dwarves at Bag End nicely done. - Azog was "trimmed to the bone". I like him a lot and he is the main antagonist in the trilogy (apart from Sauron of course). - Troll sequence was good, i never liked it to much. To much silliness, so good job =). - I wouldn't say that the whole Radagast scenes should be in, but some. I like him too and we see can still see him mounted on Gwaihir (possibly) when the eagles attack the Gundabad Army. - I like the way you handled the the arrival at Imladris, although i would have trimmed more of the Dwarves silliness and used The White Council (Kerr AUJ version). Sauron is the "Phantom Menace" and the ultimate evil behind all of what happens and that scene is very informative of what is going on. - Goblin Town, Riddles in the Dark also good. - Last battle also good. - I like more of the flashback beginning, Azog's chase and Dol Guldor's commands. We would know that the Dwarves would still be chased after but by Bolg but not seen, it would connect with when Beorn and Galdalf talk and are aware that the enemy is still after them. - Good riddance of the love triangle =))). - No Orc chase and barrels sequence. Excellent. - Black Arrow's should be mentioned but not seen as they are in the movie: "The Black Arrow was a single regular-sized arrow, forged by Thrór, who was the King under the Mountain before its fall seated in the Lonely Mountain, according to The Hobbit. It is not known if it had any magical properties, but Bard said that he had successfully retrieved it every time he used it"
- Lake town should have been trimmed even further but i can live with your approach lol. - After that everything was cool except for the part of Smaug's exiting the mountain. You used the same scene of Smaug when he goes after Bilbo into the Hall and when he exits the mountain. I don't recall which edit I've seen that made that exit very cool. - I think this was the least perfect of the 3 films edited. - Many things rushed and scenes not very intermingled with each other, especially in the battle itself. - Dol Guldor rescue cut. Pity, i love the extended scenes of that part of the movie and Sauron finally reveals himself to all that he has returned. - Azog's scene watching his army entering the Were-Worms holes should have been kept. - I didn't like the way you've dealt with Thorin's regaining his "sanity". it felt rushed and awkward. - When the battle begins until the end of it, many things were not smoothly done in my opinion. Ex: Bolg hits Bilbo and suddenly he is fighting Legolas who appeared out of nowhere. I know you must've done that way because of Legolas stunts with the bat but still... ; More Dwarf silliness... ; Radagast is seen in the end as I referred before even though you removed him from your edit. - Interesting choice opening on Hobbiton. It works, but I think I prefer the older Bilbo striking a match "My dear Frodo..." opening I've seen in other edits. - I missed having Gandalf name off the various dwarves as they bustled through Bag End. - The waterfall audio as they approach Rivendell was very rough. I know you mentioned in other comments that audio is not your strong suit. If I were to fix it, I'd say first get a sample with much more bass in it, then cut it in as soon as the scene changes at about 70% volume, fading it in over the next couple seconds as the camera pans closer, as if it's getting louder because you're approaching it. The music carrying over the scene change works very well and the idea behind this cut is good, it just needs some polish. - I liked your cutting of the dwarves being encircled at Rivendell by the incoming elven riders. I always thought them taking such a hostile posture was out of place for Elrond's people. The wood elves, sure, but Rivendell elves I think are beyond such intimmidation. Good work. - Not sure what I think of the song during dinner at Rivendell. Yours is the first edit I've seen that kept that scene. I think, like much of the "humor" in these films, it's funny the first time, but it detracts from the overall dignity of the films. - Slightly rough on the audio ducking out of the (cut) meeting with Galadriel. We hear the eerie musical cue of her about to show up, then it just fades out suddenly. - Again, your edit chose to keep something most have not, the "Goblintown" song sung by the king. It's hard for me to say it's a bad thing and should be removed because it -is- part of the book, but it just doesn't quite transfer over to film. - You retained gollum losing the ring--most editors cut this for two reasons: first, it's more true to the book for Bilbo to simply find the ring without knowing where it came from; and second, seeing the ring fall means Bilbo knew who it belonged to, which actually -does- make him a thief. In the book, he only slowly pieces together who the ring belonged to and by the time he figures it out, Gollum is in a rage ready to kill him and he has no choice but to escape with it. - Azog is never mentioned before he shows up, so his introduction is kind of sudden. I've seen edits retain the campfire scene where Balin tells Bilbo of Thorin's history in flashback (how he got his name "Oakenshield") and other edits that keep the goblin king's lines of "a pale orc searching for you." Either one works, but I feel it needs something. - Transitions getting out of AUJ and into DoS (from after the eagle rescue continuing into Beorn's house) are all a little rough. The music fades too suddenly, the cuts to chasing orcs and the company on the run, and the music ducking beneath Gandalf's voiceover, are all a little off. You had the right idea using Gandalf's "there is a house..." as a voiceover, though. The Maple Films edit takes Gandalf's lines about "there is a house" plus his details of Beorn "not overly fond of dwarves" as a voiceover to the scene with the eagles in flight as they carry the company over the land. Then it just cuts straight to Beorn's intro. It's not perfect, but it's the best I've seen. Or you could do like Spence and just cut everything from leaving Goblintown to entering Mirkwood, but that's rather drastic. - Excellent work all throughout Mirkwood, the spiders, the elven prison, and the barrell escape. I like that you removed Bilbo's scene with the ring and the baby spider. That always felt out of character and the Ring should not be so powerful at this time. - Good work getting rid of Master (and Alfred)--similar treatment to what Spence did and it works well. - You kept a little more of Laketown than I expected, but no real problems. I like the scene with Bard researching Thorin's name and lineage. - Really great handling of key/doorway scene--I've seen many overly-complicated solutions for trying to hide that there are missing dwarves, trying to hide their temper tantrum when the door won't show, trying to cover the fact that they gave up and started back down the mountain... yours took care of all of those issues simply and elegantly. The cut was a little rough in the audio, but that wouldn't take much to fix. - Another rough cut before "give him more time"
- You used mostly Spence solution for slaying of Smaug, too. There are differences, but it's good. I note you didn't kill the Master--I thought this would have issues (a plot hole concerning Bard's rise to de facto Master), but I think the crowd cheering for the dragon slayer is enough to grant him right of leadership--and you even managed to keep Alfrid out of it, always a plus. - More good cuts of Alfrid--not perfect, but good. As things move on, I see you've kept more Alfrid than most, but what you've kept works fine. - Thorin is defintely a bit sicker in your edit vs. others. I like the vision in the pool of gold, glad you included that. - Again, another comedic scene you've kept, this time Bifur's axe. It was amusing the first time, but I think I'd have cut it. - Editing the final fight between Thorin and Azog is very difficult--a bit quick jumping b/w scenes, but a good job. I prefer Spence's solution to Legolas. Also, a plot hole: you forgot to kill Kili (yet he's shown dead with Fili and Thorin later on). - Your ending offers a lot less closure than others--it's not bad, but it's very different. It's rather sad to see him simply looking out the window of his now emptied home, wondering where life goes now after so much has changed. My favorite edit remains the Maple Films edit (which, for whatever reason, isn't listed here on FE.org but can be found easily enough) along with a strong nod toward Spence for some key scenes. This edit is a good effort, and has some really cool ideas, but there are definitely technical issues. The video is native 1472 x 624, which is a really strange resolution--about half-way between 720p and 1080p. Aside from that, the visual consistency was fine (no color or gamma issues). Audio mix (voice channel vs. music/effects) was fine, but there were many rough cuts--about three very obvious ones plus several more that were not quite as jarring, but still not fully blended in. The concept of this edit was good--there were a few more recreational/humor scenes in this edit than in others (Goblin King's song, the jig on the dinner table in Rivendell), but most of the important cuts you'd expect from any mainstream Hobbit edit are there: Tauriel/love triangle, the stone giants, potty humor, ridiculous Legolas acrobatics, over-the-top violence, extended chase/running scenes, Alfrid--all minimized or completely gone. There were a few minor plot holes which I'm betting most viewers wouldn't notice. In all, this was a solid book edit that definitely needs some polish, but also packs a few pleasant surprises I hadn't seen before. Good work! Thanks for the very thorough review, I sincerely appreciate it. As you mention, I owe much to Spence, and the bit with the waterfall was an idea from DrFontane's cut (though the somewhat sloppy execution was my own). I had actually completed the majority of the cuts to the first two movies before I'd seen either Spence's or DrFontane's edits, so some of the similarities are coincidences, but I definitely owe Spence for his great idea on how to get Smaug out of the mountain without being covered in gold and the bit about Bard's final, fatal arrow. I wanted to avoid all reference to the black arrow nonsense, which is why I was stuck with Bilbo referring to a story we hadn't heard. I figured it wasn't too much of a stretch for the audience to assume that Bilbo had picked it up somewhere along the line, either from his books or from the dwarves. He does refer to "stories" in the plural, so he may have heard about it elsewhere earlier. I didn't actually forget Kili's death scene, of course. I felt that I had minimized his story enough that we didn't actually need to see it. As you mention, we do see his body at the end, so we do learn of his fate. But perhaps it doesn't work as I had intended. I removed all mention of Azog's name and backstory on purpose, as I didn't feel it necessary for the story. Even though Bilbo learned who Azog was in the original version of the film, he had no reason to expect him to show up when he did, so his appearance is just as surprising to Bilbo as it is to the rest of us in my edit. I'm pleased you liked the key/doorway bit. It became a lot easier when I realized that I could transform the moonlight to the light of the setting sun simply by messing with the color balance. I think it works fairly well. Of course, the difference between a happy ending and a sad ending of any story all depends on when you decide to end it. I prefer a bit more wistful and reflective ending here, but individual tastes differ. I really appreciate all of the technical comments. As hard as it may seem to believe, my ear is untrained enough that I literally do not recognize a number of the issues you mentioned, but I readily acknowledge that it's something I need to work on. And I have no idea how I ended up with the aspect ratio that I did. Some combination of checked boxes, I expect, but I'm not master enough of the software to have any idea how it came about. Again, thanks for your thoughtful comments, and I'm pleased you enjoyed the edit as much as you did. Like many Tolkien fans I went in to the cinema when the first Hobbit film came out with high hopes. 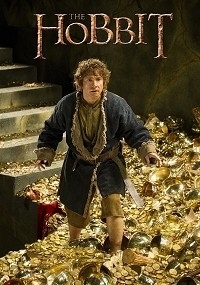 I'd enjoyed Peter Jackson's LOTR interpretations and was hoping for an enjoyable Hobbit adaptation. I was a bit worried when it was announced that the planned two films had become a trilogy, but I still had hope. Then I saw the first film, and my first reaction was "Meh". It was decent, but was in the 6/10 territory and several levels lower than the LOTR films. It felt very bloated and took ages to get going. My feelings on the second and third films were even lower, mainly thanks to the addition of the worthless Tauriel character (The Hobbit trilogy equivalent of Jar Jar Binks). The tacked on and stupid love story, the over the top CGI sequences (Barrel chase anyone?) and annoying characters (Alfrid especially) really soured me on The Hobbit trilogy. I am happy to report that Billy Batson (Henceforth referred to as B.B) has produced my go-to version of The Hobbit. With this version we start with Gandalf and Bilbo meeting, then literally 5 minutes in the Dwarves are arriving and the story is underway. What I especially like is that B.B has pruned back the over the top action sequences, but has left in the character moments. The conversation with Bilbo and Elrond at Rivendell, Nori stealing the tableware (And it later being discovered by the Goblin King), the party first meeting Beorn two at a time, the white Stag in Mirkwood, Bilbo and Bofur's conversation ("Goodbye Bilbo...") and Bifur losing his axe are all in this edit. Gone almost completely are the overdone Ring references, 98% of Alfrid's scenes (He has only a few lines left now), all of Tauriel's scenes (Good riddance) and all bar two brief moments with Legolas. The focus stays predominantly on Bilbo and the Dwarves, as it should do. I especially enjoyed B.B's work on the barrel escape sequence and the death of Smaug. Both scenes are a credit to this edition. The Jackson narrative means that unfortunately there won't ever be a version without Azog, but in this version he's just a leader Orc without a name. I watched this version with my wife and some of our friends last night, and it was a unanimous thumbs up from everyone. The only reason I rated Audio Editing as a 9 is because there were some moments where the music changes seemed a tad abrupt. That's my one very minor complaint about this stellar work. Thanks B.B. Thanks! I'm pleased you liked it. Audio editing is my weak spot, but I'll keep working on it.